Even the title promises songs: adapting the 1997 film The Wedding Singer was a natural fit for a Broadway musical. And so it proves. The amiable pastiche elisions of composer Matthew Sklar’s bubblegum, intentionally retro-feeling pop score feel like an amalgam of 1980s sounds from Manilow to Boy George, Billy Idol, Cyndi Lauper and Tina Turner (the last three of whom turn up in a parade of Vegas impersonators). It also lends itself naturally to musical comedy, with Chad Beguelin joining the original screenwriter Tim Herlihy to adapt its plot of boy-ditched-at-altar and girl-ditches-another-boy-at-wedding-chapel into a sly if rather obvious portrait of heterosexual mating rituals. But as played with an effortlessly straight (if not always straight-faced) swagger in Nick Winston’s energetic, enjoyable production, the show occupies a place somewhere between Legally Blonde and the pastiche guitar rock flavours of School of Rock. Jon Robyns lends the title character wit and vulnerability in equal measure, in which he finds himself jilted but still having to entertain happy couples celebrating their wedding day. Robyns has long been a West End stalwart but here he happily moves into a league of leading players in the Killian Donnelly mould of seemingly unassuming men who have powerhouse singing, acting and dancing credentials. 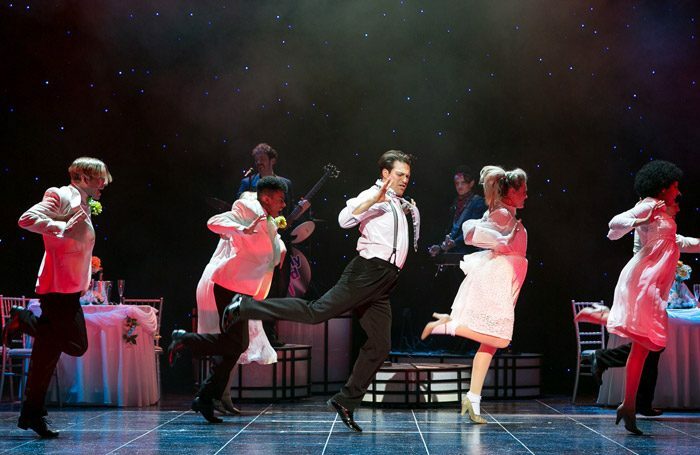 He is also appealingly partnered by Cassie Compton as the woman he falls in love with, while former Brookside actor (and sometime X Factor runner-up) Ray Quinn is also maturing interestingly into playing a cockily confident love rat here. As so often nowadays, the establishing of place and time depends on video projections, but a frame of large light boxes around the stage contains the action neatly.